The modern Portland shopper faces a crisis of near-infinite hams. With dozens of local, national and international hams available at one's fingertips, how is the savvy consumer to determine what to serve as the centerpiece of their non-denominational holiday dinner, or what to use as their go-to ham for everyday sandwiches? Luckily for you, WW gathered 18 Portland-made hams for a blind taste test. Accompanied by nothing more than a simple loaf of country bread and a bottle of Italian Amaro Montenegro, we tested the finest ham Portland had to offer. After rating every ham on a scale of 1 to 100 and dropping the lowest score, we collated the results and separated the hogwash from the squeal deal. A Creole delicacy traditionally used to flavor soups, gumbos and jambalaya, tasso is made from the shoulder of the hog, which in some schools disqualifies it as being a true ham. Well, it's 2015: traditionalism be damned. Each bite of Old Salt's tasso was a wafer-thin satin sheet of fat and smoke that melted in the mouth, dissolving from a blast of porky richness into a nuanced warmth of smoked paprika, cayenne and garlic that didn't overstay its welcome. Old Salt chef Ben Meyer, who has been visiting New Orleans with his mother since he was a high-school sophomore, revealed some of the secrets behind his best-in-show ham. "For a couple of decades I went there every year, and this has always been food that is near and dear to my heart," he says. "Tasso is an ingredient that you just don't see much up here. It's not usually even eaten as a slicer, but I'm glad it works that way. It's usually used as a cooking component—it's the base of a gumbo, or if you're making étouffée, it's pretty common to smother some tasso ham in there." Flavored with "a blend of secret hobo herbs and spices," Meyer's recipe is a break from tasso tradition. 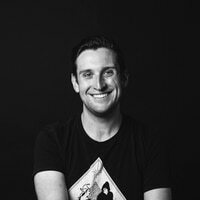 "When it's usually made, we would take the whole shoulder roast and slice it into pucks about an inch thick, and then cure those in the same cure," he says. "Because of the way we use it in the restaurant, we just cure the whole shoulder in that way. More than anything, we changed the curing time. Because of the size of the piece of meat we are using, we allow it to season out for over a week. It also smokes for a longer time, generally about five hours at a low, moderate temperature. We smoke it really low and slow so it gets bombarded and forms a shell on the outside." Old Salt's tasso is in limited supply. "If you are looking for tasso specifically, you should ask us, even if it is not in the case," Meyer says. "We only really merchandise it into the case when we have enough extra that we aren't worried about brunch. But as long as someone is willing to wait a little bit, we can make it for 'em and have it ready in a couple of weeks." Tasting notes: "Fatty, fatty, fatty—and so good for it." "This is the bacon of ham." Perfect for: Any egg dish, jambalaya, étouffée, eating with your bare hands until you pass out. Buy it: Old Salt Marketplace, 5027 NE 42nd Ave., 971-255-0167, oldsaltpdx.com, $18 per pound. Most of the smoked ham we sampled tasted at best "smoky" and at worst "chemical fiery." Northeast Portland's hazelnut-finished pork merchants Tails & Trotters had noticeable levels of both smoke and finesse. Tails & Trotters' ham started with a robust mouthful of applewood smoke flavor, which relaxed into a spiced melange of botanicals defined by a healthy burst of juniper and green herbs, finishing with a clean, traditional ham flavor. Much like a good pair of chinos, this versatile ham dresses up and down very nicely. T&T's flagship ham stands on its own as a both a big-flavored board ham and a top-shelf sandwich ham that won't be overpowered by its accoutrements. Tasting notes: "Moist, yummy, eat-it-anywhere ham." "This is the most subtle, tender smoked ham I've ever had." Perfect for: Pairing with a ton of Gruyere and heady mustard in a croque monsieur, the centerpiece of a meat-and-cheese board. Buy it: Tails & Trotters, 525 NE 24th Ave., 503-477-8682, tails-trotters.myshopify.com. $16 per pound. Sometimes the good guys win. Sometimes the scrappy underdogs take home the 101st annual Summer Camp Classic Kickball Trophy. Sometimes the house brand from Portland's girl-next-door grocery store is the best sandwich ham in the city. 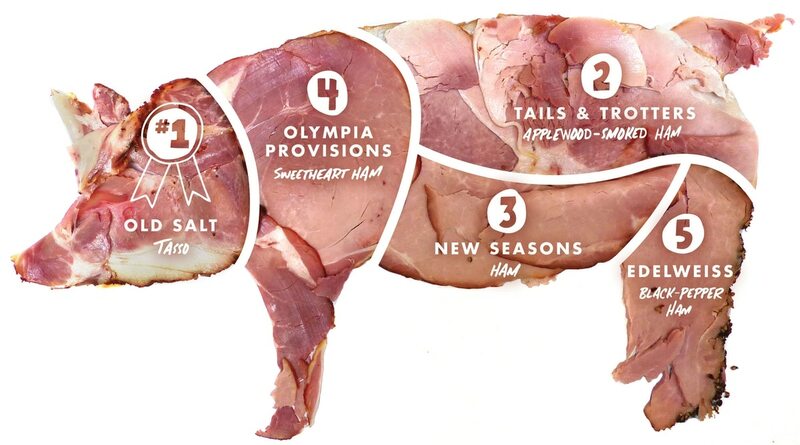 New Seasons' ham tastes like…ham. It is the platonic ham. It is the ham that they eat in Norman Rockwell paintings. Clean, moist and savory with a satisfying bite, this is the ham to have on deck when your kids bring over friends, or for a wholesome lunch you can whip up in three minutes. New Seasons makes the best no-frills workhorse ham you can get in the city. Tasting notes: "Terrific sandwich ham—moist, salty, briny." Perfect for: A week's worth of sandwiches, an enormous pot of pea-and-ham soup. Buy it: New Seasons Market, various locations, newseasonsmarket.com. $9.99 per pound. The Pacific Northwest's best salumeria also has an exceptional ham? Shocking. Elias Cairo's meat market and restaurant is something of a one-stop shop for cured meats in Portland, and you can pick up a mini-football-sized dinner along with a pack of saucissons for the road while you prepare for your in-law's impending judgment. Weighing roughly 2½ pounds and sold in increments of "half" and "whole," OP's Sweetheart ham is a lean and gently juniper-spiced meat that is made to be a lifesaver when you need to whip up a nice dinner at the last minute. Pro tip: If you only need a piece or two for the road, New Seasons sells OP Sweetheart by the slice at a slight markup. Tasting notes: "Tastes like chicken soup." "Yum! Delightful, robust juniper, excellent, sweet finish." Perfect for: A foolproof, last-minute dinner alongside a mountain of mashed potatoes; part of a charcuterie board. Buy it: Olympia Provisions, 1632 NW Thurman St., 894-8136; 107 SE Washington St., 954-3663, olympiaprovisions.com. $16 per pound. New Seasons Market, various locations, newseasonsmarket.com. $16.99 per pound. Where most of the black-pepper hams we sampled tasted like an indistinct, briny whimper limping out of the aftermath of a harsh shotgun blast of black pepper, Edelweiss' expertise in the Teutonic art of peppered-pork preservation paid off. At this German food shop, second-generation deli masters Tom and Tony Baier craft an assertively piquant coarse-black-pepper crust that complements their lean, alder-smoked barbecued ham without accosting it. The result is a delightfully rustic pepper ham that is perfect to scarf down in large quantities alongside other strong flavors, ideally after a hard day of yard work. Tasting notes: "This is what pepper cure should be." "Delightfully peppery, turkeylike." Perfect for: Serving as a main course alongside a hearty chunk of imported country German rye bread, caraway-spiced sauerkraut, beer mustard and a growler of Upright's Engelberg Pilsner. Buy it: Edelweiss Sausage & Delicatessen, 3119 SE 12th Ave., 238-4411, edelweissdeli.com. $10.99 per pound. Willamette Week's ham task force tasted these Portland-made hams, with unmarked prosciutto di Parma as a control: Chop deli ham, Gartner's classic ham, Otto's dry-cured ham, New Seasons Market ham, Gartner's pepper ham, Edelweiss Black Forest ham, Otto's Black Forest ham, Olympia Provisions Sweetheart ham, Laurelhurst Market ham, Old Salt tasso, Edelweiss honey ham, Edelweiss black-pepper ham, Edelweiss barbecue ham, Old Salt ham, Tails & Trotters applewood-smoked ham.